From Goodreads ~ When it comes to exposing tax fraud, Tara and her partner, Eddie, are really cleaning up. From their brilliant takedown of the disappearing “Tax Wizard” to their perfectly planned downfall of the “Deduction Diva,” they’ve earned the respect of their peers at Criminal Investigations. Now Tara’s ready to celebrate with an ice-cold pitcher of peach sangria - even if her next case is totally the pits. Tara’s looking forward to a challenge but, back at the office, everyone’s looking for love. Her boss Lu “The Lobo” Lobozinski and office virgin Josh Schmidt are signing up for an online dating service, and - to Tara’s dismay - so is her crush, Special Agent Nick Pratt. Tara’s trying to act chill. But when she learns that her next case involves cash-funneling to terrorists, it’s not just her love life that’s on the rocks. It’s her life, period. Tara and her partner, Eddie, are IRS agents. They have a stack of cases of wacky people to catch who are tax frauds. In addition, they are helping the CIA try to catch terrorists who are sending money home to fund their murderous activities (I found this a bit heavy). There is lots happening on the love front. Tara is torn between staying with Brett, her nice boyfriend of a couple months, or pursuing something with her co-worker, Nick, who she can be herself with. Her friend, Alicia, feels that she and her boyfriend, Daniel, are going nowhere so moves out and moves in with Tara. Another friend, Christina, gets engaged to Dr. Ajay. Her boss, Lu, co-worker, Josh, and even Nick join an online dating service and start meeting some of their matches. This is the fourth book in the Tara Holloway series (and the fourth book I've read by this author). I read the first one and third one in the series within the last couple of weeks but haven't read the second one (yet!) ... they work as stand alones as there was enough information from the past ones so you know what's going on. I enjoyed this one. I liked the writing style ... it was funny and sarcastic. It is written in first person perspective from Tara's point of view. As a head's up, there is some swearing. I liked Tara, though I found her a bit annoying as she struggled to decide between Brett and Nick. She wanted to have a break from Brett so she could check things out with Nick and she was surprised when Nick got mad about this. I didn't think it was right that she wanted to put Brett on the back-burner in case things didn't work out with Nick. But Nick, as cool as he is, handled the situation well by not waiting for her. Their colleague, Josh, was funny. He's a computer geek who finds someone on the dating site who is a geek too but is also way more edgy than he is. 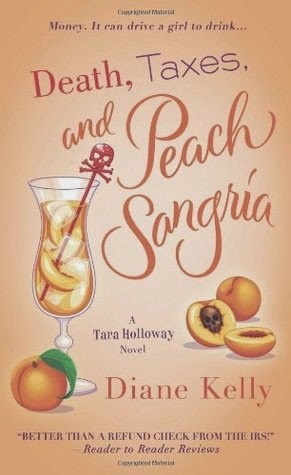 There is a lot of peach sangria consumed ... and the recipe is right in the beginning of the book (and it sounds delish!). This sounds like a book I would like.